It's time to get the public relations arm of your GTA Online Organization spinning with a piece of cinematic propaganda to play at the AGM and distribute to shareholders and partners. And while cheery stock footage of families waving and co-workers shaking hands may be the traditional approach for such corporate videos, they are looking for a more accurate representation of the types of aggressive venture capitalism your enterprise specializes in. Rockstar has got some slick prizes fit for any underworld boss to feature in his or her Executive penthouse, so gather your trusted staff and show what your Organization is made of. Now that both GTA Online: Further Adventures in Finance and Felony and Executives and Other Criminals have launched, Rockstar is looking for short films made purely with the Rockstar Editor showcasing your Organization's criminal endeavors. Be it a specific story or action sequence showing how your Organization exercises a hostile takeover, or a ‘push it to the limit’ style music video montage detailing how you dominate in ruthless and risky business - get creative! Remember that you must feature content from GTA Online: Further Adventures in Finance and Felony and/or Executives and Other Criminals in addition to meeting the other requirements detailed below. The grand prize winning director will receive three exclusive prizes each customized with their Social Club ID. For the first time ever, Rockstar is giving away the Rockstar Editor trophy bearing the Rockstar Editor logo, to sit proudly on the mantel of the winner alongside future BAFTAs, Oscars and Palme d'Ors. As if that wasn't enough, the winning director will also be calling the shots for their next epic from the comfort of a customized director's chair, bearing the winner's Social Club ID and the Rockstar Editor logo. Finally, the ultra-rare and exclusive GTAV Varsity Jacket will be yours to wear on set or on location. It also will be customized with your Social Club ID on a special custom patch confirming your status as an award-winning Rockstar Editor auteur. Two runners-up will each receive a $100 Rockstar Warehouse gift card and a deluxe prize pack of official GTAV gear, as well as being featured here at the Rockstar Newswire. 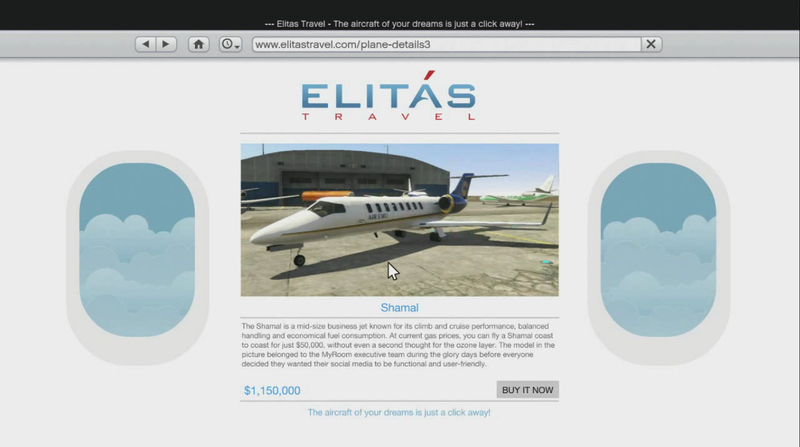 • Your video must feature content from GTA Online: Further Adventures in Finance and Felony and/or Executives and Other Criminals. • Your video must be published to Rockstar Games Social Club and tagged with the word "#CEO" between now and 11:59pm ET on July 18th, 2016 to be eligible. • Your video must be made entirely using the Rockstar Editor. They know that many advanced Rockstar Editor video creators like to use additional third party editing software, but in order to keep this competition fair for all entrants, they require that you only use the Rockstar Editor in producing the video. After viewing all qualifying entries, Rockstar Games will pick the winner by taking into consideration adherence to or interpretation of the Creative Brief mentioned above, entertainment and artistic value, editing quality and overall creativity. Keep an eye on the Social Club contest page to see how other Social Club members think your video stacks up against the competition and stay tuned for the winners announcement later this summer. Void in certain countries and where prohibited. See www.rockstargames.com/socialclub/events/contests for official rules and eligibility details. 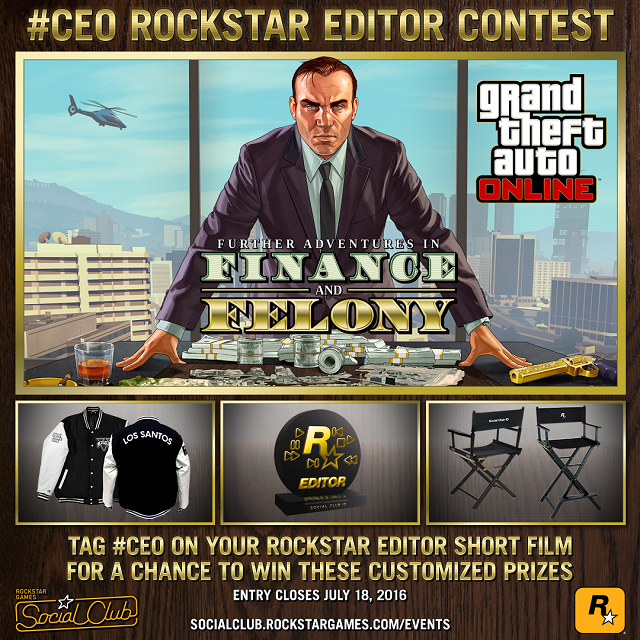 The #CEO Rockstar Editor Contest - The next Rockstar Video Editor contest is live! Show off your VIP empire with style and you could win cool prizes!